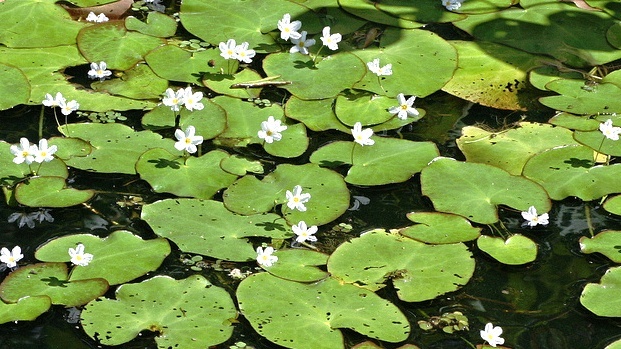 Nymphoides is a genus of aquatic plants grown for their lovely white or yellow flowers. These plants are commonly known as Floating-Heart plants because of their heart shaped leaves that float on the surface of the water. The heart-shaped leaves have their roots submerged in the water and small white flowers that nod along the floating leaves. Nymphoides is widely grown across Africa, Asia, Australia and America in ponds, aquariums and ornamental water gardens. Most of the species vary in shape and size but their basic structure and growing habit is similar. Unlike other aquatic plants, they do not sprawl much and can be grown in rather small ponds. They can be grown along the margins of ponds in about 12″ of water, or in a pot in open water in up to 20″ of water where they can form small colonies. Flowers usually appear in mid spring through the summer, and frequently into the fall. Propagation can be done from divisions or runners. Nymphoides indica or Water Snowflake: Fast-growing perennial with white flowers that have feathery edges. Nymphoides cristata: Beautiful aquatic plant with heart-shaped green leaves that have purple veins. White flowers appear in spring or summer. Nymphoides pelata: Easy to grow and low-maintenance aquatic plant with lovely yellow flowers.